Google has a patent for Google Doodles, Salk didn't patent the polio vaccine. 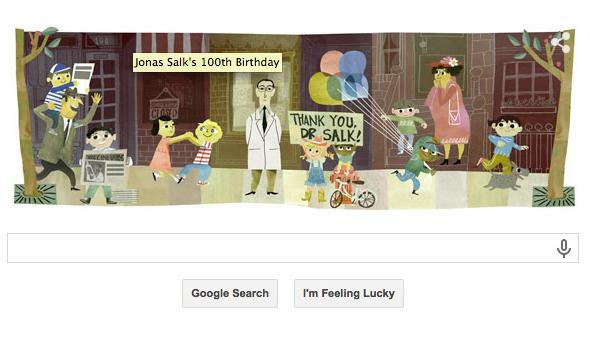 Today’s Google Doodle About Jonas Salk Is Patented. The Polio Vaccine Isn’t. Happy birthday! Here’s some irony! It’s not every day that you get to enjoy rich irony along with your morning look at the latest Google Doodle. But today is such a day. To celebrate Jonas Salk’s 100th birthday (he died in 1995 at 80), Google made him a thank-you Doodle that depicts healthy children and some adults playing and happily going about their lives. It’s a nice gesture! But it’s also funny. As Nigel Cameron, the president of the Center for Policy on Emerging Technologies, pointed out on Twitter, there’s a weird dissonance between the spirit of Salk’s vaccine discovery—as exemplified by his famous decision not to patent it—and the fact that Google spent 10 years lobbying to get Google Doodles patented, and eventually succeeded. As Brian Palmer pointed out in an April Slate piece about Salk’s decision not to patent the vaccine, Salk’s famous rhetorical question, “Could you patent the sun?” is an oversimplification of the complicated questions behind intellectual property. Salk’s contribution was significant, and his selflessness made him seem like even more of a hero, but his decision isn’t widely applicable or practical. Something is certainly weird, though, when a sketch is patented and one of the most important discoveries of modern medicine isn’t.